Your Hip Flexors AREN’T Tight – How to Truly Fix "Tight Hips"
21 Nov Your Hip Flexors AREN’T Tight – How to Truly Fix "Tight Hips"
Whether in the clinic or in the gym, on a daily basis people tell me they have tight hip flexors. They’ve seen a YouTube video about how tight hip flexors can cause problems or their local PT / Chrio / Massage Therapist has repeatedly told them that tight hip flexors are the source of all their problems. These athletes then roll, stretch, dig, and destroy this horrible muscle that is the sole reasoning behind their pain and limited performance. Unfortunately, I see far too often that they have no actually had their hip flexor mobility tested. Instead, they blindly follow the online guru’s advice or their clinicians exercise recommendation – when hip flexor mobility may or may NOT be a real issue. 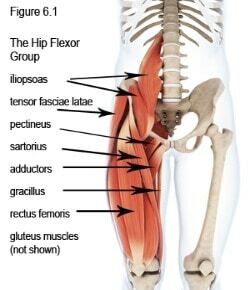 Don’t get me wrong…there are plenty of people out there with truly tight hip flexors…but there are also lots of people who think they have tight hip flexors when truly they have weak hip flexors manifesting themselves as a muscle with increased TONE. First, let’s cover hip flexor anatomy. The iliopsoas (most commonly “tight” hip flexor) is composed of two muscles, the psoas and iliacus that share a common to insert onto the hip. The psoas originates on the vertebral bodies of the lumbar spine and the iliacus originates on the iliac fossa. The tensor fasciae latae (TFL) originates or the ASIS of the iliac crest and inserts onto the IT band. The rectus femoris (one of the four quad muscles) also inserts onto the pelvis, making it a hip flexor. To truly assess flexibility of the hip flexor musculature, the Thomas Test should be used. This quick test can be performed by any athlete, coach, or clinician. The athlete begins sitting on the very edge of a box or treatment table. Next, they lie back holding their knees towards their chest (but not pulled all the way to their chest). The partner then holds and lowers on of the two legs down. 1. Does the thigh reach full extension (the thigh parallel to the ground). 2. Is the knee able to bend to 90 degrees of flexion without the thigh raising? If the knee does not make it to 90 degrees without the rising, tightness of the rectus femoris is to blame. If the knee can flex to 90 degrees without the thigh rising but the thigh is unable to reach full extension, illiopsoas tightness is present. 3. Does the thigh migrate laterally? If so, TFL tightness is present. Without performance of muscle flexibility testing, it is irresponsible to diagnose (yourself or patient) with having tightened hip flexor musculature..
.So, what if you’ve been told repeatedly that you have tight hip flexors but pass the above test? Rather than the usual grind, mash, and destroy technique athletes use with a kettle-bell that I frequently see athletes painfully performing, I prefer a gentler technique such as that suggested by TheManualTherapist.com (remember we are decreasing TONE not increasing muscle tissue length so crazy pain is not needed). While follow up exercises are always individual to the athlete I’m working with, the following are two of my favorites. First, I like this glute bridge variation that makes the athlete work very hard to reach full hip extension. Second, I love supine marching to activate the psoas during a core stabilization exercise. The athlete must maintain a neutral lumbar spine (cue them to keep their spine flat on the ground) while moving the lower body. Often times, I must regress to more basic exercises before this if the athlete cannot find and maintain a neutral spine. This combination of release and activate often does wonders for abolishing the symptoms of “tight hip flexors” in a fraction of the time compared to the months of stretching athletes have previously performed. Remember with any exercise or mobility prescription, it is important to assess if the mobility work you are doing is truly the cause of your dysfunctions. Too often, we blindly follow the advice of online gurus and clinicians who fail to take the time to actually assess.